Mix all ingredients except cheese and tomatoes in 12-inch skillet. Heat to boiling; reduce heat. Cover and simmer 5 minutes. Uncover and simmer 5 to 10 minutes, stirring occasionally, until vegetables are tender. Stir in cheese and tomatoes until cheese is melted. Keep with the Southwest-flavor theme by serving this meatless skillet meal with warmed tortillas or tortilla chips and sliced avocados and tomatoes. For a heartier, meatier meal, you can add cooked ground beef or turkey with the beans. 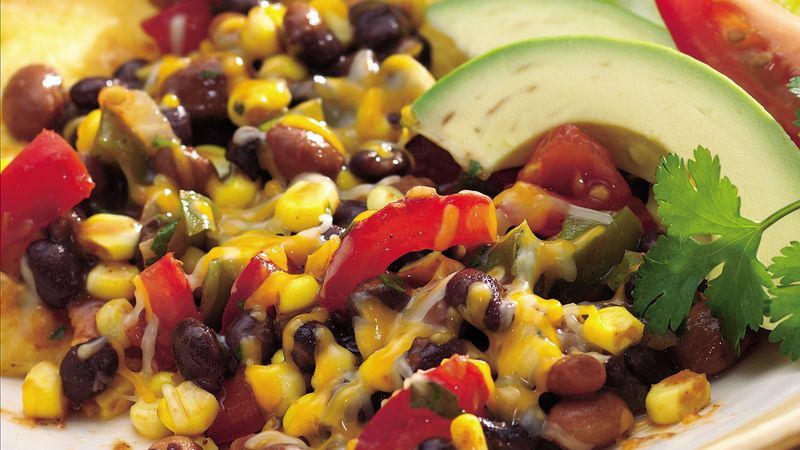 Chili beans give a boost of flavor to this recipe, so be sure not to drain. The canned pinto beans are in a sauce of tomato paste, chili powder and other spices.